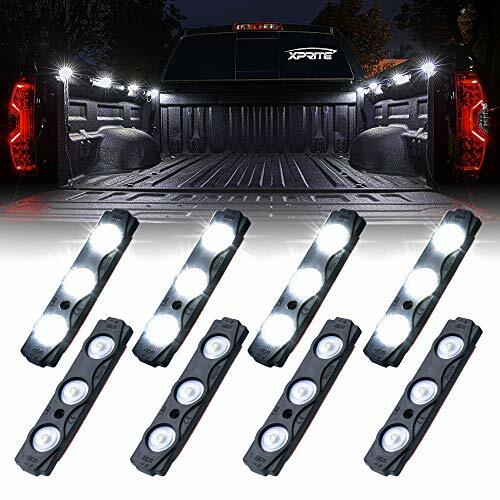 1.LED lighting system includes two separate strands of 4 light pods with 3 LEDs per pod giving you a total of 8 pods and 24 ultra-bright SMD LEDs. 2.Each truck bed light strand includes 2 feet of wire between each pod, and features 21 feet of power wire, giving you plenty of length when it comes to running the power wires into your cab and to the included on/off switch. 3.Each Pod is can effortlessly be mounted in your truck bed rails or wheel wells using either the included 3M tape or screws, connectors between each unit allows flexibility for custom install. If you have any questions about this product by Xprite, contact us by completing and submitting the form below. If you are looking for a specif part number, please include it with your message.